City of Delaware Police Department Patrol Officer Robert Hatcher gives a presentation about scammers Wednesday afternoon at SourcePoint. He said residents can research scams at the Federal Trade Commission’s website, ftc.gov/scams, and said residents could sign up for free scam alerts. City of Delaware Patrol Officer Robert Hatcher gave a presentation at SourcePoint on Wednesday detailing numerous scams and giving local residents some advice to avoid being the victim of fraud. “We would be here until next week if we talked about all the scams out there,” Hatcher said. Hatcher detailed some of the more prevalent scams for the attendees and warned them about fraudulent calls from the IRS, healthcare companies or even scammers pretending to be your grandchildren or the Jamaican lottery. Hatcher said the IRS or healthcare scammers usually state that the victim owes back taxes or has an outstanding balance and pressures them into wiring them money through the bank or orders them to buy Green Dot Cards, a type of prepaid debit card, and send them the card numbers. Likewise, Hatcher said the scammers will pretend to be grandchildren who are stranded in a foreign country or pretend they are a lottery organization and tell the victim they’ve won a large cash prize and need to pay a fee before they can receive the prize money. Hatcher said the IRS will send letters, not make phone calls, if they have a problem and said you cannot win any lottery if you didn’t enter. Hatcher said these callers will scam people out of tens of thousands of dollars and said the effects of losing that kind of money can be devastating. Hatcher also said that some scammers will pretend to be from the police department and will threaten to take them to jail if they don’t pay a fine over the phone. “Police won’t call asking for money,” Hatcher said. Hatcher then outlined a few ways to avoid fraud. Hatcher said people should search for that number online and see if others have reported that it was a scam. Hatcher also said not to believe caller ID because scammers have ways of making caller ID appear to be from someone else. Hatcher also encouraged people to hang up on robocalls and block their numbers if they have smart phones. According to Hatcher, it’s also good just to talk to someone you trust if you think a call is suspicious. He said con artists will try to get their victims to make decisions in a hurry and said simply getting another opinion from someone you trust can be a great way to spot a fraud. He added if you are the victim of a fraud you can contact law enforcement at 740-203-1111 and they will transfer you to the appropriate law enforcement agency. Hatcher said it’s very difficult to catch these scammers and recover lost money. 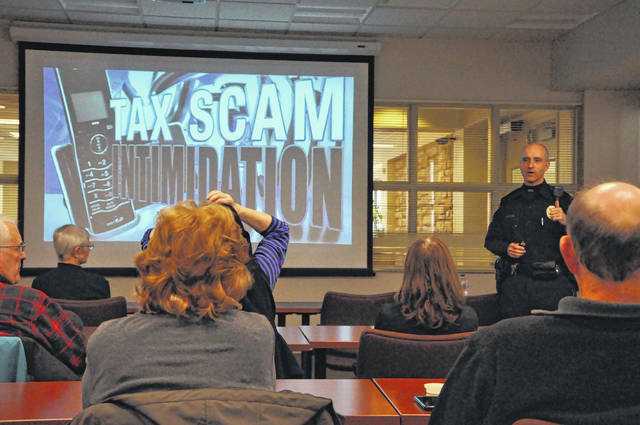 Hatcher encouraged residents to do more research at the Federal Trade Commission’s website, ftc.gov/scams, and said residents could sign up for free scam alerts. This entry was tagged delaware police report. Bookmark the permalink.